Graphene can be considered as an indefinitely large aromatic molecule, the ultimate case of the family of flat polycyclic aromatic hydrocarbons. Graphite, the most common allotrope of carbon, is basically a stack of graphene layers held together with weak bonds. Fullerenes and carbon nanotubes, two other forms of carbon, have structures similar to that of graphene; which can also be viewed as a fullerene or nanotube of infinitely large size. Graphene has many uncommon properties. It is the strongest material ever tested, conducts heat and electricity efficiently, and is nearly transparent, yet surprisingly opaque for a 1-atom-thick layer. Graphene shows a large and nonlinear diamagnetism, greater than that of graphite, and can be levitated by neodymium magnets. It is a semimetal with small overlap between the valence and the conduction bands (a material with zero bandgap). The name "graphene" is a combination of "graphite" and the suffix -ene, named by Hanns-Peter Boehm and colleagues, who produced and observed single-layer carbon foils in 1962. The quantum mechanical explanation for these properties is that graphene is a zero-gap semiconductor, because its conduction and valence bands meet at the Dirac points, which are six locations in momentum space, on the edge of the Brillouin zone, divided into two non-equivalent sets of three points. The two sets are labeled K and K'. The sets give graphene a valley degeneracy of gv = 2. By contrast, for traditional semiconductors the primary point of interest is generally Γ, where momentum is zero. Therefore, electrons propagating through graphene's honeycomb lattice effectively lose their mass, producing quasi-particles (known as massless Dirac fermions) that are described by a 2D analogue of the Dirac equation rather than the Schrödinger equation for spin-​1⁄2 particles. However, in a strip of graphene a few atoms wide (a graphene nanoribbon), the electronic bandgap depends on the width of the strip, and its orientation with respect to the lattice. For the "zig-zag" orientation, the bandgap is zero. If it is "armchair", the bandgap is non-zero. (semiconducting or metallic depending on width). Superconductivity has been observed in twisted bilayer graphene. Multi-parametric surface plasmon resonance (MP-SPR) was used to characterize both thickness and refractive index of chemical-vapor-deposition (CVD)-grown graphene films. The measured refractive index and extinction coefficient values at 670 nm wavelength are 3.135 and 0.897, respectively. The thickness was determined as 3.7 Å from a 0.5 mm area, which agrees with 3.35 Å reported for layer-to-layer carbon atom distance of graphite crystals. The MP-SPR method can be used for real-time label-free interactions of graphene with organic and inorganic substances. The existence of unidirectional surface plasmons in the nonreciprocal graphene-based gyrotropic interfaces has been demonstrated theoretically. By efficiently controlling the chemical potential of graphene, the unidirectional working frequency can be continuously tunable from THz to near-infrared and even visible. Particularly, the unidirectional frequency bandwidth can be 1–2 orders of magnitude larger than that in metal under the same magnetic field, which arises from the superiority of extremely small effective electron mass in graphene. Such[which?] unique absorption could become saturated when the input optical intensity is above a threshold value. This nonlinear optical behavior is termed saturable absorption and the threshold value is called the saturation fluence. Graphene can be saturated readily under strong excitation over the visible to near-infrared region, due to the universal optical absorption and zero band gap. This has relevance for the mode locking of fiber lasers, where fullband mode locking has been achieved by a graphene-based saturable absorber. Due to this special property, graphene has wide application in ultrafast photonics. The optical response of graphene/graphene oxide layers can be tuned electrically. Saturable absorption in graphene could occur at the Microwave and Terahertz bands, owing to its wideband optical absorption property. The microwave saturable absorption in graphene demonstrates the possibility of graphene microwave and terahertz photonics devices, such as a microwave saturable absorber, modulator, polarizer, microwave signal processing and broad-band wireless access networks. It has been suggested that the isotopic composition, the ratio of 12C to 13C, has a significant impact on thermal conductivity. For example, isotopically pure 12C graphene has higher thermal conductivity than either a 50:50 isotope ratio or the naturally occurring 99:1 ratio. It can be shown by using the Wiedemann–Franz law, that the thermal conduction is phonon-dominated. However, for a gated graphene strip, an applied gate bias causing a Fermi energy shift much larger than kBT can cause the electronic contribution to increase and dominate over the phonon contribution at low temperatures. The ballistic thermal conductance[further explanation needed] of graphene is isotropic. A prediction that was published in 2015 suggested a melting point of ≈4510 K. Recent[when?] and more sophisticated modelling has increased this temperature to at least 5000 K. At 6000 K (the sun's surface having an effective temperature of 5,777 K) graphene melts into an agglomeration of loosely coupled doubled bonded chains, before becoming a gas. It has also been reported that graphene can be modified, through the use of defects, to exhibit a negative Poisson's ratio (auxetic behaviour). Despite its strength, graphene is also relatively brittle, with a fracture toughness of about 4 MPa√m. This indicates that imperfect graphene is likely to crack in a brittle manner like ceramic materials, as opposed to many metallic materials that have fracture toughnesses in the range of 15–50 MPa√m. Graphene shows a greater ability to distribute force from an impact than any known material, ten times that of steel per unit weight. The force[clarification needed] was transmitted at 22.2 kilometres per second (13.8 mi/s). A production unit produces continuous monolayer sheets of High Strength Metallurgical Graphene (HSMG). The process is based on graphene growth on a liquid metal matrix. In 2013, a three-dimensional honeycomb of hexagonally arranged carbon was termed 3D graphene. Self-supporting 3D graphene was produced that year. Three dimensional bilayer graphene was reported in 2012 and 2014. In 2016, a box-shaped graphene (BSG) nanostructure resulted from mechanical cleavage of pyrolytic graphite has been reported. The discovered nanostructure is a multilayer system of parallel hollow nanochannels located along the surface that displayed quadrangular cross-section. The thickness of the channel walls is approximately equal to 1 nm, the typical width of channel facets makes about 25 nm. In 2017, freestanding graphene gyroids with 35 nm and 60 nm unit cells were fabricated via controlled direct chemical vapor deposition. They represent the smallest free standing periodic graphene 3D structures yet produced with a pore size of tens of nm. A graphene gyroid has five percent of the density of steel, yet is ten times as strong with an enormous surface area to volume ratio. An aerogel made of graphene layers separated by carbon nanotubes was measured at 0.16 milligrams per cubic centimeter. The material has superior elasticity and absorption: it can recover completely after more than 90% compression, and absorb up to 900 times its weight in oil, at a rate of 68.8 grams per second. Dispersing graphite in a liquid medium can produce graphene by sonication followed by centrifugation. The addition of dispersants (e.g., graphene quantum dots) can facilitate the exfoliation process, forming aqueous graphene dispersion with high yield. Such process is straightforward, low-cost, and environmentally friendly. Sonicating graphite at the interface of two immiscible liquids, most notably heptane and water, produced macro-scale graphene films. Graphite particles can be corroded in molten salts to form a variety of carbon nanostructures including graphene. Electrochemical synthesis can exfoliate graphene. Varying a pulsed voltage controls thickness, flake area, number of defects and affects its properties. The process begins by bathing the graphite in a solvent for intercalation. The process can be tracked by monitoring the solution’s transparency with an LED and photodiode. A joint effort from the University of Pennsylvania, Shanghai Institute of Ceramics, Queensland University of Technology, and Rice University has led to the development of carbon nanotube supercapacitors that can offer three times the energy density of most carbon-based nanomaterials. The scientists on this team utilized silicon and graphene to develop carbon nanotubes 4-6 nm wide and then doped the carbon atoms with nitrogen. This process causes a chemical reaction which allows the material to store up to three times more energy without compromising their power density. Fuqiang Huang, a researcher on this project, reports that the fabricated carbon nanotube integrated supercapacitors are able to store up to 41 Wh/kg of energy; for comparison, an average lead acid battery has an energy density of 33 - 42 Wh/kg. Additionally, the supercapacitors offer a substantially higher power density of 70 - 250 Wh/kg compared to average lead acid battery which is capable of .2 - 1 Wh/kg. This breakthrough demonstrates that supercapacitors can provide a performance that matches, and even supersedes, of conventional energy storage methods. To put this achievement into perspective, a materials scientist from University of Pennsylvania, I-Wei Chen, stated that the implementation of these supercapacitors would allow an average bus to make 25 km trips with a recharge time of only 30 seconds. In 2016, Henrik Fisker announced development of an electric car that will use graphene supercapacitor instead of lithium-ion batteries. [needs update] Its low energy density as compared to lithium-ion batteries is being addressed. The planned electric car would target a minimum range of 400 miles (640 km). It has been announced later that the electric car produced by Fisker Inc. will still use lithium-ion batteries, but research in graphene supercapacitors will continue by Nanotech Energy Inc.
A lump of graphite, a graphene transistor, and a tape dispenser, a tool that was used for the exfoliation of single-layer graphene from graphite in 2004. Donated to the Nobel Museum in Stockholm by Andre Geim and Konstantin Novoselov in 2010. ^ "graphene definition, meaning – what is graphene in the British English Dictionary & Thesaurus – Cambridge Dictionaries Online". cambridge.org. 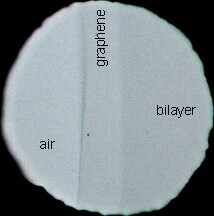 ^ a b "graphene layer". IUPAC Compendium of Chemical Terminology. IUPAC Gold Book. International Union of Pure and Applied Chemistry. 2009. doi:10.1351/goldbook.G02683. ISBN 978-0-9678550-9-7. Retrieved 31 March 2012. ^ Lee, C.; Wei, X.; Kysar, J. W.; Hone, J. (18 July 2008). "Measurement of the Elastic Properties and Intrinsic Strength of Monolayer Graphene". Science. 321 (5887): 385–388. doi:10.1126/science.1157996. ISSN 0036-8075. PMID 18635798. ^ a b c Balandin, Alexander A.; Ghosh, Suchismita; Bao, Wenzhong; Calizo, Irene; Teweldebrhan, Desalegne; Miao, Feng; Lau, Chun Ning (March 2008). "Superior Thermal Conductivity of Single-Layer Graphene". Nano Letters. 8 (3): 902–907. doi:10.1021/nl0731872. ISSN 1530-6984. PMID 18284217. ^ Sheehy, Daniel E.; Schmalian, Jörg (23 November 2009). "Optical transparency of graphene as determined by the fine-structure constant". Physical Review B. 80 (19). arXiv:0906.5164. doi:10.1103/PhysRevB.80.193411. ISSN 1098-0121. ^ a b Zhu, Shou-En; Yuan, Shengjun; Janssen, G. C. A. M. (1 October 2014). "Optical transmittance of multilayer graphene". EPL. 108 (1): 17007. arXiv:1409.4664. Bibcode:2014EL....10817007Z. doi:10.1209/0295-5075/108/17007. ^ Li, Zhilin; Chen, Lianlian; Meng, Sheng; Guo, Liwei; Huang, Jiao; Liu, Yu; Wang, Wenjun; Chen, Xiaolong (2015). "Field and temperature dependence of intrinsic diamagnetism in graphene: Theory and experiment". Phys. Rev. B. 91 (9): 094429. Bibcode:2015PhRvB..91i4429L. doi:10.1103/PhysRevB.91.094429. ^ a b Ho, Kuan-I; Boutchich, Mohamed; Su, Ching-Yuan; Moreddu, Rosalia; Marianathan, Eugene Sebastian Raj; Montes, Laurent; Lai, Chao-Sung (2015). "A Self-Aligned High-Mobility Graphene Transistor: Decoupling the Channel with Fluorographene to Reduce Scattering". Advanced Materials. 27 (41): 6519–6525. doi:10.1002/adma.201502544. PMID 26398725. ^ a b Boehm, H. P.; Clauss, A.; Fischer, G. O.; Hofmann, U. (1 July 1962). "Das Adsorptionsverhalten sehr dünner Kohlenstoff-Folien". Zeitschrift für Anorganische und Allgemeine Chemie. 316 (3–4): 119–127. doi:10.1002/zaac.19623160303. ^ a b Novoselov, K. S.; Geim, A. K.; Morozov, S. V.; Jiang, D.; Zhang, Y.; Dubonos, S. V.; Grigorieva, I. V.; Firsov, A. A. (22 October 2004). "Electric Field Effect in Atomically Thin Carbon Films". Science. 306 (5696): 666–669. arXiv:cond-mat/0410550. Bibcode:2004Sci...306..666N. doi:10.1126/science.1102896. PMID 15499015. ^ "This Month in Physics History: October 22, 2004: Discovery of Graphene". APS News. Series II. 18 (9): 2. 2009. ^ "The Story of Graphene". www.graphene.manchester.ac.uk. The University of Manchester. 10 September 2014. Retrieved 9 October 2014. ^ "The Nobel Prize in Physics 2010". The Nobel Foundation. Retrieved 3 December 2013. ^ Boehm, H. P.; Setton, R.; Stumpp, E. (1994). "Nomenclature and terminology of graphite intercalation compounds" (PDF). Pure and Applied Chemistry. 66 (9): 1893–1901. doi:10.1351/pac199466091893. Archived from the original (PDF) on 6 April 2012. ^ Simpson, C. D.; Brand, J. Diedrich; Berresheim, Alexander J.; Przybilla, Laurence; Räder, Hans Joachim; Müllen, Klaus (2002). "Synthesis of a Giant 222 Carbon Graphite Sheet". Chemistry. 8 (6): 1424–1429. doi:10.1002/1521-3765(20020315)8:6<1424::AID-CHEM1424>3.0.CO;2-Z. ^ a b c Geim, A. (2009). "Graphene: Status and Prospects". Science. 324 (5934): 1530–4. arXiv:0906.3799. Bibcode:2009Sci...324.1530G. doi:10.1126/science.1158877. PMID 19541989. ^ Ghoneim, Mohamed. (2012). "Nanotechnology: CVD Graphene Transfer". YouTube. ^ a b Ghoneim, Mohamed T.; Smith, Casey E.; Hussain, Muhammad M. (6 May 2013). "Simplistic graphene transfer process and its impact on contact resistance". Applied Physics Letters. 102 (18): 183115. Bibcode:2013ApPhL.102r3115G. doi:10.1063/1.4804642. ^ Riedl, C.; Coletti, C.; Iwasaki, T.; Zakharov, A.A.; Starke, U. (2009). "Quasi-Free-Standing Epitaxial Graphene on SiC Obtained by Hydrogen Intercalation". Physical Review Letters. 103 (24): 246804. arXiv:0911.1953. Bibcode:2009PhRvL.103x6804R. doi:10.1103/PhysRevLett.103.246804. PMID 20366220. ^ a b c d e Cooper, Daniel R.; D’Anjou, Benjamin; Ghattamaneni, Nageswara; Harack, Benjamin; Hilke, Michael; Horth, Alexandre; Majlis, Norberto; Massicotte, Mathieu; Vandsburger, Leron; Whiteway, Eric; Yu, Victor (2012). "Experimental Review of Graphene". ISRN Condensed Matter Physics. International Scholarly Research Network. 2012: 1–56. doi:10.5402/2012/501686. ^ Kasuya, D.; Yudasaka, M.; Takahashi, K.; Kokai, F.; Iijima, S. (2002). "Selective Production of Single-Wall Carbon Nanohorn Aggregates and Their Formation Mechanism". J. Phys. Chem. B. 106 (19): 4947–4951. doi:10.1021/jp020387n. ^ Bernatowicz, Thomas J; Cowsik, Ramanath; Gibbons, Patrick C; Lodders, Katharina; Fegley, Bruce; Amari, Sachiko; Lewis, Roy S (1996). "Constraints on stellar grain formation from presolar graphite in the Murchison meteorite". Astrophysical Journal. 472 (2): 760–782. Bibcode:1996ApJ...472..760B. doi:10.1086/178105. ^ Fraundorf, P.; Wackenhut, M. (2002). "The core structure of presolar graphite onions". Astrophysical Journal Letters. 578 (2): L153–156. arXiv:astro-ph/0110585. Bibcode:2002ApJ...578L.153F. doi:10.1086/344633. ^ Zan, Recep; Ramasse, Quentin M.; Bangert, Ursel; Novoselov, Konstantin S. (2012). "Graphene re-knits its holes". Mesoscale and Nanoscale Physics. 12 (8): 3936–3940. arXiv:1207.1487v1. Bibcode:2012NanoL..12.3936Z. doi:10.1021/nl300985q. PMID 22765872. ^ Puiu, Tibi (12 July 2012). "Graphene sheets can repair themselves naturally". ZME Science. ^ a b c Meyer, J.; Geim, A. K.; Katsnelson, M. I.; Novoselov, K. S.; Booth, T. J.; Roth, S. (2007). "The structure of suspended graphene sheets". Nature. 446 (7131): 60–63. arXiv:cond-mat/0701379. Bibcode:2007Natur.446...60M. doi:10.1038/nature05545. PMID 17330039. 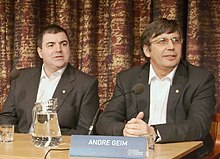 ^ a b c d Geim & Novoselov 2007. ^ a b Carlsson, J. M. (2007). "Graphene: Buckle or break". Nature Materials. 6 (11): 801–2. Bibcode:2007NatMa...6..801C. doi:10.1038/nmat2051. PMID 17972931. ^ a b Fasolino, A.; Los, J. H.; Katsnelson, M. I. (2007). "Intrinsic ripples in graphene". Nature Materials. 6 (11): 858–61. arXiv:0704.1793. Bibcode:2007NatMa...6..858F. doi:10.1038/nmat2011. PMID 17891144. ^ a b Ishigami, Masa; et al. (2007). "Atomic Structure of Graphene on SiO2". Nano Letters. 7 (6): 1643–1648. arXiv:0811.0587. Bibcode:2007NanoL...7.1643I. doi:10.1021/nl070613a. PMID 17497819. ^ Shenderova, O. B.; Zhirnov, V. V.; Brenner, D. W. (2002). "Carbon Nanostructures". Critical Reviews in Solid State and Materials Sciences. 27 (3–4): 227–356. Bibcode:2002CRSSM..27..227S. doi:10.1080/10408430208500497. ^ Polini, Marco; Guinea, Francisco; Lewenstein, Maciej; Manoharan, Hari C.; Pellegrini, Vittorio (1 September 2013). "Artificial honeycomb lattices for electrons, atoms and photons". Nature Nanotechnology. 8 (9): 625–633. arXiv:1304.0750. Bibcode:2013NatNa...8..625P. doi:10.1038/nnano.2013.161. PMID 24002076. ^ Plotnik, Yonatan; Rechtsman, Mikael C.; Song, Daohong; Heinrich, Matthias; Zeuner, Julia M.; Nolte, Stefan; Lumer, Yaakov; Malkova, Natalia; Xu, Jingjun (1 January 2014). "Observation of unconventional edge states in 'photonic graphene'". Nature Materials. 13 (1): 57–62. arXiv:1210.5361. Bibcode:2014NatMa..13...57P. doi:10.1038/nmat3783. PMID 24193661. ^ Bellec, Matthieu; Kuhl, Ulrich; Montambaux, Gilles; Mortessagne, Fabrice (14 January 2013). "Topological Transition of Dirac Points in a Microwave Experiment". Physical Review Letters. 110 (3): 033902. arXiv:1210.4642. Bibcode:2013PhRvL.110c3902B. doi:10.1103/PhysRevLett.110.033902. PMID 23373925. ^ Scheeler, Sebastian P.; Mühlig, Stefan; Rockstuhl, Carsten; Hasan, Shakeeb Bin; Ullrich, Simon; Neubrech, Frank; Kudera, Stefan; Pacholski, Claudia (12 September 2013). "Plasmon Coupling in Self-Assembled Gold Nanoparticle-Based Honeycomb Islands". The Journal of Physical Chemistry C. 117 (36): 18634–18641. doi:10.1021/jp405560t. ^ Jacqmin, T.; Carusotto, I.; Sagnes, I.; Abbarchi, M.; Solnyshkov, D. D.; Malpuech, G.; Galopin, E.; Lemaître, A.; Bloch, J. (18 March 2014). "Direct Observation of Dirac Cones and a Flatband in a Honeycomb Lattice for Polaritons". Physical Review Letters. 112 (11): 116402. arXiv:1310.8105. Bibcode:2014PhRvL.112k6402J. doi:10.1103/PhysRevLett.112.116402. PMID 24702392. ^ "Spin-dependent hexagonal lattice. : Multi-component quantum gases in spin-dependent hexagonal lattices : Nature Physics : Nature Publishing Group". www.nature.com. Retrieved 26 September 2015. ^ Bonaccorso, F.; Colombo, L.; Yu, G.; Stoller, M.; Tozzini, V.; Ferrari, A. C.; Ruoff, R. S.; Pellegrini, V. (2015). "Graphene, related two-dimensional crystals, and hybrid systems for energy conversion and storage". Science. 347 (6217): 1246501. Bibcode:2015Sci...347...41B. doi:10.1126/science.1246501. PMID 25554791. ^ a b Charlier, J.-C.; Eklund, P.C. ; Zhu, J.; Ferrari, A.C. (2008). Jorio, A.; Dresselhaus and, G.; Dresselhaus, M.S. (eds.). Electron and Phonon Properties of Graphene: Their Relationship with Carbon Nanotubes. Carbon Nanotubes: Advanced Topics in the Synthesis, Structure, Properties and Applications. Berlin/Heidelberg: Springer-Verlag. ^ a b c d Novoselov, K. S.; Geim, A. K.; Morozov, S. V.; Jiang, D.; Katsnelson, M. I.; Grigorieva, I. V.; Dubonos, S. V.; Firsov, A. A. (2005). "Two-dimensional gas of massless Dirac fermions in graphene". Nature. 438 (7065): 197–200. arXiv:cond-mat/0509330. Bibcode:2005Natur.438..197N. doi:10.1038/nature04233. PMID 16281030. ^ Morozov, S.V. ; Novoselov, K.; Katsnelson, M.; Schedin, F.; Elias, D.; Jaszczak, J.; Geim, A. (2008). "Giant Intrinsic Carrier Mobilities in Graphene and Its Bilayer". Physical Review Letters. 100 (1): 016602. arXiv:0710.5304. Bibcode:2008PhRvL.100a6602M. doi:10.1103/PhysRevLett.100.016602. PMID 18232798. ^ Akturk, A.; Goldsman, N. (2008). "Electron transport and full-band electron–phonon interactions in graphene". Journal of Applied Physics. 103 (5): 053702. Bibcode:2008JAP...103e3702A. doi:10.1063/1.2890147. ^ a b Kusmartsev, F. V.; Wu, W. M.; Pierpoint, M. P.; Yung, K. C. (2014). "Application of Graphene within Optoelectronic Devices and Transistors". arXiv:1406.0809 [cond-mat.mtrl-sci]. ^ Physicists Show Electrons Can Travel More Than 100 Times Faster in Graphene :: University Communications Newsdesk, University of Maryland Archived 19 September 2013 at the Wayback Machine. Newsdesk.umd.edu (24 March 2008). Retrieved on 12 January 2014. ^ a b Neto, A Castro; Peres, N. M. R.; Novoselov, K. S.; Geim, A. K.; Geim, A. K. (2009). "The electronic properties of graphene" (PDF). Rev Mod Phys. 81 (1): 109–162. arXiv:0709.1163. Bibcode:2009RvMP...81..109C. doi:10.1103/RevModPhys.81.109. Archived from the original (PDF) on 15 November 2010. ^ Cao, Yuan; Fatemi, Valla; Fang, Shiang; Watanabe, Kenji; Taniguchi, Takashi; Kaxiras, Efthimios; Jarillo-Herrero, Pablo (5 March 2018). "Unconventional superconductivity in magic-angle graphene superlattices". Nature. 556 (7699): 43–50. arXiv:1803.02342. doi:10.1038/nature26160. ISSN 0028-0836. PMID 29512651. ^ a b Nair, R. R.; Blake, P.; Grigorenko, A. N.; Novoselov, K. S.; Booth, T. J.; Stauber, T.; Peres, N. M. R.; Geim, A. K. (6 June 2008). "Fine Structure Constant Defines Visual Transparency of Graphene". Science. 320 (5881): 1308. arXiv:0803.3718. Bibcode:2008Sci...320.1308N. doi:10.1126/science.1156965. PMID 18388259. ^ Kuzmenko, A. B.; Van Heumen, E.; Carbone, F.; Van Der Marel, D. (2008). "Universal infrared conductance of graphite". Physical Review Letters. 100 (11): 117401. arXiv:0712.0835. Bibcode:2008PhRvL.100k7401K. doi:10.1103/PhysRevLett.100.117401. PMID 18517825. ^ "Graphene Gazing Gives Glimpse Of Foundations Of Universe". ScienceDaily. 4 April 2008. ^ Jussila, Henri; Yang, He; Granqvist, Niko; Sun, Zhipei (5 February 2016). "Surface plasmon resonance for characterization of large-area atomic-layer graphene film". Optica. 3 (2): 151–158. doi:10.1364/OPTICA.3.000151. ^ Lin, Xiao; Xu, Yang; Zhang, Baile; Hao, Ran; Chen, Hongsheng; Li, Erping (2013). "Unidirectional surface plasmons in nonreciprocal graphene". New Journal of Physics. 15 (11): 113003. Bibcode:2013NJPh...15k3003L. doi:10.1088/1367-2630/15/11/113003. ^ Zhang, Y.; Tang, Tsung-Ta; Girit, Caglar; Hao, Zhao; Martin, Michael C.; Zettl, Alex; Crommie, Michael F.; Shen, Y. Ron; Wang, Feng (11 June 2009). "Direct observation of a widely tunable bandgap in bilayer graphene". Nature. 459 (7248): 820–823. Bibcode:2009Natur.459..820Z. doi:10.1038/nature08105. PMID 19516337. ^ Liu, Junfeng; Wright, A. R.; Zhang, Chao; Ma, Zhongshui (29 July 2008). "Strong terahertz conductance of graphene nanoribbons under a magnetic field". Appl. Phys. Lett. 93 (4): 041106–041110. Bibcode:2008ApPhL..93d1106L. doi:10.1063/1.2964093. ^ a b Kurum, U.; Liu, Bo; Zhang, Kailiang; Liu, Yan; Zhang, Hao (2011). "Electrochemically tunable ultrafast optical response of graphene oxide". Applied Physics Letters. 98 (2): 141103. Bibcode:2011ApPhL..98b1103M. doi:10.1063/1.3540647. ^ Sreekanth, K.V. ; Zeng, Shuwen; Shang, Jingzhi; Yong, Ken-Tye; Yu, Ting (2012). "Excitation of surface electromagnetic waves in a graphene-based Bragg grating". Scientific Reports. 2: 737. Bibcode:2012NatSR...2E.737S. doi:10.1038/srep00737. PMC 3471096. PMID 23071901. ^ Bao, Qiaoliang; Zhang, Han; Wang, Yu; Ni, Zhenhua; Yan, Yongli; Shen, Ze Xiang; Loh, Kian Ping; Tang, Ding Yuan (2009). "Atomic-Layer Graphene as a Saturable Absorber for Ultrafast Pulsed Lasers" (PDF). Advanced Functional Materials. 19 (19): 3077–3083. arXiv:0910.5820. doi:10.1002/adfm.200901007. Archived from the original (PDF) on 17 July 2011. Zhang, H.; Tang, D. Y.; Zhao, L. M.; Bao, Q. L.; Loh, K. P. (2009). "Large energy mode locking of an erbium-doped fiber laser with atomic layer graphene" (PDF). Optics Express. 17 (20): 17630–5. arXiv:0909.5536. Bibcode:2009OExpr..1717630Z. doi:10.1364/OE.17.017630. PMID 19907547. Archived from the original (PDF) on 17 July 2011. ^ Zheng, Z.; Zhao, Chujun; Lu, Shunbin; Chen, Yu; Li, Ying; Zhang, Han; Wen, Shuangchun (2012). "Microwave and optical saturable absorption in graphene". Optics Express. 20 (21): 23201–23214. Bibcode:2012OExpr..2023201Z. doi:10.1364/OE.20.023201. PMID 23188285. ^ Zhang, H.; Virally, Stéphane; Bao, Qiaoliang; Kian Ping, Loh; Massar, Serge; Godbout, Nicolas; Kockaert, Pascal (2012). "Z-scan measurement of the nonlinear refractive index of graphene". Optics Letters. 37 (11): 1856–1858. arXiv:1203.5527. Bibcode:2012OptL...37.1856Z. doi:10.1364/OL.37.001856. PMID 22660052. ^ Dong, H; Conti, C; Marini, A; Biancalana, F (2013). "Terahertz relativistic spatial solitons in doped graphene metamaterials". Journal of Physics B: Atomic, Molecular and Optical Physics. 46 (15): 15540. doi:10.1088/0953-4075/46/15/155401. ^ Dremetsika, E.; Dlubak, B.; Gorza, S.-P.; Ciret, Ch. ; Martin, M.-B. ; Hofman, S.; Seneor, P.; Dolfi, D.; Massar, S.; Emplit, Ph. ; Kockaert, P. (2016). "Measuring the nonlinear refractive index of graphene using the optical Kerr effect method". Optics Letters. 41 (14): 3281–3284. arXiv:1607.00911. Bibcode:2016OptL...41.3281D. doi:10.1364/OL.41.003281. PMID 27420515. ^ Kazemi, E; et al. (2016). "Development of a novel mixed hemimicelles dispersive micro solid phase extraction using 1-hexadecyl-3-methylimidazolium bromide coated magnetic graphene for the separation and preconcentration of fluoxetine in different matrices before its determination by fiber optic linear array spectrophotometry and mode-mismatched thermal lens spectroscopy". Analytica Chimica Acta. 905: 85–92. doi:10.1016/j.aca.2015.12.012. PMID 26755141. ^ Tang, Libin; Ji, Rongbin; Cao, Xiangke; Lin, Jingyu; Jiang, Hongxing; Li, Xueming; Teng, Kar Seng; Luk, Chi Man; Zeng, Songjun; Hao, Jianhua; Lau, Shu Ping (2014). "Deep Ultraviolet Photoluminescence of Water-Soluble Self-Passivated Graphene Quantum Dots". ACS Nano. 8 (6): 6312–6320. doi:10.1021/nn300760g. PMID 22559247. ^ Tang, Libin; Ji, Rongbin; Li, Xueming; Bai, Gongxun; Liu, Chao Ping; Hao, Jianhua; Lin, Jingyu; Jiang, Hongxing; Teng, Kar Seng; Yang, Zhibin; Lau, Shu Ping (2012). "Deep Ultraviolet to Near-Infrared Emission and Photoresponse in Layered N-Doped Graphene Quantum Dots". ACS Nano. 8 (6): 5102–5110. doi:10.1021/nn501796r. PMID 24848545. ^ Tang, Libin; Ji, Rongbin; Li, Xueming; Teng, Kar Seng; Lau, Shu Ping (2013). "Size-Dependent Structural and Optical Characteristics of Glucose-Derived Graphene Quantum Dots". Particle & Particle Systems Characterization. 30 (6): 523–531. doi:10.1002/ppsc.201200131. ^ Li, Xueming; Lau, Shu Ping; Tang, Libin; Ji, Rongbin; Yang, Peizhi (2013). "Multicolour Light emission from chlorine-doped graphene quantum dots". J. Mater. Chem. C. 1 (44): 7308–7313. doi:10.1039/C3TC31473A. ^ Li, Lingling; Wu, Gehui; Yang, Guohai; Peng, Juan; Zhao, Jianwei; Zhu, Jun-Jie (2013). "Focusing on luminescent graphene quantum dots: current status and future perspectives". Nanoscale. 5 (10): 4015–39. Bibcode:2013Nanos...5.4015L. doi:10.1039/C3NR33849E. PMID 23579482. ^ Li, Xueming; Lau, Shu Ping; Tang, Libin; Ji, Rongbin; Yang, Peizhi (2014). "Sulphur Doping: A Facile Approach to Tune the Electronic Structure and Optical Properties of Graphene Quantum Dots". Nanoscale. 6 (10): 5323–5328. Bibcode:2014Nanos...6.5323L. doi:10.1039/C4NR00693C. PMID 24699893. ^ Zhao, Jianhong; Tang*, Libin; Xiang*, Jinzhong; Ji*, Rongbin; Yuan, Jun; Zhao, Jun; Yu, Ruiyun; Tai, Yunjian; Song, Liyuan (2014). "Chlorine Dopted Graphene Quantum Dots: Preparation, Properties, and Photovoltaic Detectors". Applied Physics Letters. 105 (11): 111116. Bibcode:2014ApPhL.105k1116Z. doi:10.1063/1.4896278. ^ Touloukian, Y S. (1970). Thermophysical Properties of Matter: Thermal conductivity : nonmetallic solids. IFI/Plenum. ISBN 978-0-306-67020-6. ^ Yousefzadi Nobakht, Ali; Shin, Seungha (14 December 2016). "Anisotropic control of thermal transport in graphene/Si heterostructures". Journal of Applied Physics. 120 (22): 225111. Bibcode:2016JAP...120v5111Y. doi:10.1063/1.4971873. ^ Cai, Weiwei; Moore, Arden L.; Zhu, Yanwu; Li, Xuesong; Chen, Shanshan; Shi, Li; Ruoff, Rodney S. (2010). "Thermal Transport in Suspended and Supported Monolayer Graphene Grown by Chemical Vapor Deposition". Nano Letters. 10 (5): 1645–1651. Bibcode:2010NanoL..10.1645C. doi:10.1021/nl9041966. PMID 20405895. ^ Faugeras, Clement; Faugeras, Blaise; Orlita, Milan; Potemski, M.; Nair, Rahul R.; Geim, A. K. (2010). "Thermal Conductivity of Graphene in Corbino Membrane Geometry". ACS Nano. 4 (4): 1889–1892. arXiv:1003.3579. doi:10.1021/nn9016229. PMID 20218666. ^ Xu, Xiangfan; Pereira, Luiz F. C.; Wang, Yu; Wu, Jing; Zhang, Kaiwen; Zhao, Xiangming; Bae, Sukang; Tinh Bui, Cong; Xie, Rongguo; Thong, John T. L.; Hong, Byung Hee; Loh, Kian Ping; Donadio, Davide; Li, Baowen; Özyilmaz, Barbaros (2014). "Length-dependent thermal conductivity in suspended single-layer graphene". Nature Communications. 5: 3689. arXiv:1404.5379. Bibcode:2014NatCo...5E3689X. doi:10.1038/ncomms4689. PMID 24736666. ^ Lee, Jae-Ung; Yoon, Duhee; Kim, Hakseong; Lee, Sang Wook; Cheong, Hyeonsik (2011). "Thermal conductivity of suspended pristine graphene measured by Raman spectroscopy". Physical Review B. 83 (8): 081419. arXiv:1103.3337. Bibcode:2011PhRvB..83h1419L. doi:10.1103/PhysRevB.83.081419. ^ Seol, J. H.; Jo, I.; Moore, A. L.; Lindsay, L.; Aitken, Z. H.; Pettes, M. T.; Li, X.; Yao, Z.; Huang, R.; Broido, D.; Mingo, N.; Ruoff, R. S.; Shi, L. (2010). "Two-Dimensional Phonon Transport in Supported Graphene". Science. 328 (5975): 213–216. Bibcode:2010Sci...328..213S. doi:10.1126/science.1184014. PMID 20378814. ^ Klemens, P. G. (2001). "Theory of Thermal Conduction in Thin Ceramic Films". International Journal of Thermophysics. 22 (1): 265–275. doi:10.1023/A:1006776107140. ^ Jang, Wanyoung; Chen, Zhen; Bao, Wenzhong; Lau, Chun Ning; Dames, Chris (2010). "Thickness-Dependent Thermal Conductivity of Encased Graphene and Ultrathin Graphite". Nano Letters. 10 (10): 3909–3913. Bibcode:2010NanoL..10.3909J. doi:10.1021/nl101613u. PMID 20836537. ^ Pettes, Michael Thompson; Jo, Insun; Yao, Zhen; Shi, Li (2011). "Influence of Polymeric Residue on the Thermal Conductivity of Suspended Bilayer Graphene". Nano Letters. 11 (3): 1195–1200. Bibcode:2011NanoL..11.1195P. doi:10.1021/nl104156y. PMID 21314164. ^ Chen, Shanshan; Wu, Qingzhi; Mishra, Columbia; Kang, Junyong; Zhang, Hengji; Cho, Kyeongjae; Cai, Weiwei; Balandin, Alexander A.; Ruoff, Rodney S. (2012). "Thermal conductivity of isotopically modified graphene". Nature Materials (published 10 January 2012). 11 (3): 203–207. arXiv:1112.5752. Bibcode:2012NatMa..11..203C. doi:10.1038/nmat3207. PMID 22231598. ^ Saito, K.; Nakamura, J.; Natori, A. (2007). "Ballistic thermal conductance of a graphene sheet". Physical Review B. 76 (11): 115409. Bibcode:2007PhRvB..76k5409S. doi:10.1103/PhysRevB.76.115409. ^ Liang, Qizhen; Yao, Xuxia; Wang, Wei; Liu, Yan; Wong, Ching Ping (2011). 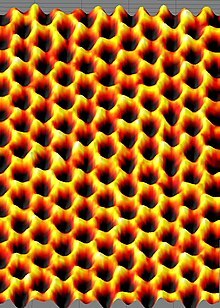 "A Three-Dimensional Vertically Aligned Functionalized Multilayer Graphene Architecture: An Approach for Graphene-Based Thermal Interfacial Materials". ACS Nano. 5 (3): 2392–2401. doi:10.1021/nn200181e. PMID 21384860. ^ a b Mingo, N.; Broido, D.A. (2005). "Carbon Nanotube Ballistic Thermal Conductance and Its Limits". Physical Review Letters. 95 (9): 096105. Bibcode:2005PhRvL..95i6105M. doi:10.1103/PhysRevLett.95.096105. PMID 16197233. ^ Mounet, N.; Marzari, N. (2005). "First-principles determination of the structural, vibrational and thermodynamic properties of diamond, graphite, and derivatives". Physical Review B. 71 (20): 205214. arXiv:cond-mat/0412643. Bibcode:2005PhRvB..71t5214M. doi:10.1103/PhysRevB.71.205214. ^ Lifshitz, I.M. (1952). "Journal of Experimental and Theoretical Physics (in Russian)". 22: 475. ^ Los, J. H.; Zakharchenko, K. V.; Katsnelson, M. I.; Fasolino, Annalisa (2015). "Melting temperature of graphene". Phys. Rev. B. 91 (4): 045415. arXiv:1503.03811. Bibcode:2015PhRvB..91d5415L. doi:10.1103/PhysRevB.91.045415. ^ Williams, D. R. (29 May 2014). "Sun Fact Sheet". NASA. Retrieved 31 January 2017. ^ Ganz, E.; Ganz, A. B.; Yang, L-M.; Dornfelda, M (2017). "The initial stages of melting of graphene between 4000 K and 6000 K". Phys. Chem. Chem. Phys. 19 (5): 3756–3762. Bibcode:2017PCCP...19.3756G. doi:10.1039/C6CP06940A. PMC 5319407. PMID 28098275. ^ Heyrovska, Raji (2008). "Atomic Structures of Graphene, Benzene and Methane with Bond Lengths as Sums of the Single, Double and Resonance Bond Radii of Carbon". arXiv:0804.4086 [physics.gen-ph]. ^ a b c Lee, C.; Wei, X.; Kysar, J. W.; Hone, J. (2008). "Measurement of the Elastic Properties and Intrinsic Strength of Monolayer Graphene". Science. 321 (5887): 385–8. Bibcode:2008Sci...321..385L. doi:10.1126/science.1157996. PMID 18635798. Lay summary. ^ "2010 Nobel Physics Laureates" (PDF). nobelprize.org. ^ Briggs, Benjamin D.; Nagabhirava, Bhaskar; Rao, Gayathri; Deer, Robert; Gao, Haiyuan; Xu, Yang; Yu, Bin (2010). "Electromechanical robustness of monolayer graphene with extreme bending". Applied Physics Letters. 97 (22): 223102. Bibcode:2010ApPhL..97v3102B. doi:10.1063/1.3519982. ^ Zandiatashbar, A.; Lee, G.-H.; An, S. J.; Lee, S.; Mathew, N.; Terrones, M.; Hayashi, T.; Picu, R. C.; Hone, J.; Koratkar, N. (2014). "Effect of defects on the intrinsic strength and stiffness of graphene". Nature Communications. 5: 3186. Bibcode:2014NatCo...5E3186Z. doi:10.1038/ncomms4186. PMID 24458268. Lay summary. ^ Frank, I. W.; Tanenbaum, D. M.; Van Der Zande, A.M.; McEuen, P. L. (2007). "Mechanical properties of suspended graphene sheets" (PDF). J. Vac. Sci. Technol. B. 25 (6): 2558–2561. Bibcode:2007JVSTB..25.2558F. doi:10.1116/1.2789446. ^ Braga, S.; Coluci, V. R.; Legoas, S. B.; Giro, R.; Galvão, D. S.; Baughman, R. H. (2004). "Structure and Dynamics of Carbon Nanoscrolls". Nano Letters. 4 (5): 881–884. Bibcode:2004NanoL...4..881B. doi:10.1021/nl0497272. ^ Nandwana, Dinkar; Ertekin, Elif (11 March 2015). "Ripples, Strain, and Misfit Dislocations: Structure of Graphene–Boron Nitride Superlattice Interfaces". Nano Letters. 15 (3): 1468–1475. Bibcode:2015NanoL..15.1468N. doi:10.1021/nl505005t. PMID 25647719. ^ Nandwana, Dinkar; Ertekin, Elif (21 June 2015). "Lattice mismatch induced ripples and wrinkles in planar graphene/boron nitride superlattices". Journal of Applied Physics. 117 (23): 234304. arXiv:1504.02929. Bibcode:2015JAP...117w4304N. doi:10.1063/1.4922504. ^ Bolmatov, Dima; Mou, Chung-Yu (2011). "Graphene-based modulation-doped superlattice structures". Journal of Experimental and Theoretical Physics (JETP). 112 (1): 102–107. arXiv:1011.2850. Bibcode:2011JETP..112..102B. doi:10.1134/S1063776111010043. ^ Grima, J. N.; Winczewski, S.; Mizzi, L.; Grech, M. C.; Cauchi, R.; Gatt, R.; Attard, D.; Wojciechowski, K.W. ; Rybicki, J. (2014). "Tailoring Graphene to Achieve Negative Poisson's Ratio Properties". Advanced Materials. 27 (8): 1455–1459. doi:10.1002/adma.201404106. PMID 25504060. ^ Ren, Zhaodi; Meng, Nan; Shehzad, Khurram; Xu, Yang; Qu, Shaoxing; Yu, Bin; Luo, Jack (2015). "Mechanical properties of nickel-graphene composites synthesized by electrochemical deposition". Nanotechnology. 26 (6): 065706. Bibcode:2015Nanot..26f5706R. doi:10.1088/0957-4484/26/6/065706. PMID 25605375. ^ Grima, Joseph N.; Grech, Michael C.; Grima‐Cornish, James N.; Gatt, Ruben; Attard, Daphne (2018). "Giant Auxetic Behaviour in Engineered Graphene". Annalen der Physik. 530 (6): 1700330. doi:10.1002/andp.201700330. ISSN 1521-3889. ^ Grima, Joseph N.; Winczewski, Szymon; Mizzi, Luke; Grech, Michael C.; Cauchi, Reuben; Gatt, Ruben; Attard, Daphne; Wojciechowski, Krzysztof W.; Rybicki, Jarosław (2015). "Tailoring Graphene to Achieve Negative Poisson's Ratio Properties". Advanced Materials. 27 (8): 1455–1459. doi:10.1002/adma.201404106. ISSN 1521-4095. PMID 25504060. ^ Zhang, Peng; Ma, Lulu; Fan, Feifei; Zeng, Zhi; Peng, Cheng; Loya, Phillip E.; Liu, Zheng; Gong, Yongji; Zhang, Jiangnan; Zhang, Xingxiang; Ajayan, Pulickel M.; Zhu, Ting; Lou, Jun (2014). "Fracture toughness of graphene". Nature Communications. 5: 3782. Bibcode:2014NatCo...5E3782Z. doi:10.1038/ncomms4782. PMID 24777167. ^ Dorrieron, Jason (4 December 2014). "Graphene Armor Would Be Light, Flexible and Far Stronger Than Steel". Singularity Hub. Retrieved 6 October 2016. ^ Coxworth, Ben (1 December 2014). "Graphene could find use in lightweight ballistic body armor". Gizmag. Retrieved 6 October 2016. ^ Nayak, Tapas R.; Andersen, Henrik; Makam, Venkata S.; Khaw, Clement; Bae, Sukang; Xu, Xiangfan; Ee, Pui-Lai R.; Ahn, Jong-Hyun; Hong, Byung Hee (28 June 2011). "Graphene for Controlled and Accelerated Osteogenic Differentiation of Human Mesenchymal Stem Cells". ACS Nano. 5 (6): 4670–4678. doi:10.1021/nn200500h. PMID 21528849. ^ Tehrani, Z. (1 September 2014). "Generic epitaxial graphene biosensors for ultrasensitive detection of cancer risk biomarker". 2D Materials. 1 (2): 025004. Bibcode:2014TDM.....1b5004T. doi:10.1088/2053-1583/1/2/025004. ^ Qvit, Nir; Disatnik, Marie-Hélène; Sho, Eiketsu; Mochly-Rosen, Daria (22 June 2016). "Selective Phosphorylation Inhibitor of Delta Protein Kinase C–Pyruvate Dehydrogenase Kinase Protein–Protein Interactions: Application for Myocardial Injury in Vivo". Journal of the American Chemical Society. 138 (24): 7626–7635. doi:10.1021/jacs.6b02724. PMC 5065007. PMID 27218445. ^ "Graphene shown to safely interact with neurons in the brain". University of Cambridge. 29 January 2016. Retrieved 16 February 2016. ^ "Single and Multilayer Growth of Graphene from the Liquid Phase". www.scientific.net. Retrieved 1 July 2015. ^ "Polish scientists find way to make super-strong graphene sheets | Graphene-Info". www.graphene-info.com. Retrieved 1 July 2015. ^ Min, Hongki; Sahu, Bhagawan; Banerjee, Sanjay; MacDonald, A. (2007). "Ab initio theory of gate induced gaps in graphene bilayers". Physical Review B. 75 (15): 155115. arXiv:cond-mat/0612236. Bibcode:2007PhRvB..75o5115M. doi:10.1103/PhysRevB.75.155115. ^ Barlas, Yafis; Côté, R.; Lambert, J.; MacDonald, A. H. (2010). "Anomalous Exciton Condensation in Graphene Bilayers". Physical Review Letters. 104 (9): 96802. arXiv:0909.1502. Bibcode:2010PhRvL.104i6802B. doi:10.1103/PhysRevLett.104.096802. PMID 20367001. ^ a b Min, Lola; Hovden, Robert; Huang, Pinshane; Wojcik, Michal; Muller, David A.; Park, Jiwoong (2012). "Twinning and Twisting of Tri- and Bilayer Graphene". Nano Letters. 12 (3): 1609–1615. Bibcode:2012NanoL..12.1609B. doi:10.1021/nl204547v. PMID 22329410. ^ Wang, H.; Sun, K.; Tao, F.; Stacchiola, D. J.; Hu, Y. H. (2013). "3D Honeycomb-Like Structured Graphene and Its High Efficiency as a Counter-Electrode Catalyst for Dye-Sensitized Solar Cells". Angewandte Chemie. 125 (35): 9380–9384. doi:10.1002/ange.201303497. ^ Harris PJF (2012). "Hollow structures with bilayer graphene walls". Carbon. 50 (9): 3195–3199. doi:10.1016/j.carbon.2011.10.050. ^ Harris PJ, Slater TJ, Haigh SJ, Hage FS, Kepaptsoglou DM, Ramasse QM, Brydson R (2014). "Bilayer graphene formed by passage of current through graphite: evidence for a three dimensional structure". Nanotechnology. 25 (46): 465601. Bibcode:2014Nanot..25.5601H. doi:10.1088/0957-4484/25/46/465601. PMID 25354780. ^ Cebo, T.; Aria, A. I.; Dolan, J.A. ; Weatherup, R. S.; Nakanishi, K.; Kidambi, P. R.; Divitini, G.; Ducati, C.; Steiner, U.; Hofmann, S. (2017). "Chemical vapour deposition of freestanding sub-60 nm graphene gyroids". Appl. Phys. Let. 111 (25): 253103. Bibcode:2017ApPhL.111y3103C. doi:10.1063/1.4997774. ^ Szondy, David (9 January 2017). "New 3D graphene is ten times as strong as steel". newatlas.com. Retrieved 17 February 2017. ^ Zhao, Qin; Gang, Seob Jung; Min, Jeong Kang; Buehler, Markus J. (6 January 2017). "The mechanics and design of a lightweight three-dimensional graphene assembly". Science Advances. 3 (1): e1601536. Bibcode:2017SciA....3E1536Q. doi:10.1126/sciadv.1601536. PMC 5218516. PMID 28070559. ^ Anthony, Sebastian (10 April 2013). "Graphene aerogel is seven times lighter than air, can balance on a blade of grass – Slideshow | ExtremeTech". ExtremeTech. Retrieved 11 October 2015. ^ Jayasena, Buddhika; Subbiah Sathyan (2011). "A novel mechanical cleavage method for synthesizing few-layer graphenes". Nanoscale Research Letters. 6 (95): 95. Bibcode:2011NRL.....6...95J. doi:10.1186/1556-276X-6-95. PMC 3212245. PMID 21711598. ^ Eigler, S.; Enzelberger-Heim, M.; Grimm, S.; Hofmann, P.; Kroener, W.; Geworski, A.; Dotzer, C.; Röckert, M.; Xiao, J.; Papp, C.; Lytken, O.; Steinrück, H.-P.; Müller, P.; Hirsch, A. (2013). "Wet Chemical Synthesis of Graphene". Advanced Materials. 25 (26): 3583–3587. doi:10.1002/adma.201300155. PMID 23703794. ^ "A new method of producing large volumes of high-quality graphene". KurzweilAI. 2 May 2014. Retrieved 3 August 2014. ^ Paton, Keith R. (2014). "Scalable production of large quantities of defect-free few-layer graphene by shear exfoliation in liquids". Nature Materials. 13 (6): 624–630. Bibcode:2014NatMa..13..624P. doi:10.1038/nmat3944. hdl:2262/73941. PMID 24747780. ^ "Laser Scribing of High-Performance and Flexible Graphene-Based Electrochemical Capacitors". Sciencemag.org. 16 March 2012. ^ Hernandez, Y.; Nicolosi, V.; Lotya, M.; Blighe, F. M.; Sun, Z.; De, S.; McGovern, I. T.; Holland, B.; Byrne, M.; Gun'Ko, Y. K.; Boland, J. J.; Niraj, P.; Duesberg, G.; Krishnamurthy, S.; Goodhue, R.; Hutchison, J.; Scardaci, V.; Ferrari, A. C.; Coleman, J. N. (2008). "High-yield production of graphene by liquid-phase exfoliation of graphite". Nature Nanotechnology. 3 (9): 563–568. arXiv:0805.2850. Bibcode:2008NatNa...3..563H. doi:10.1038/nnano.2008.215. PMID 18772919. ^ Zeng, Minxiang; Shah, Smit A.; Huang, Dali; Parviz, Dorsa; Yu, Yi-Hsien; Wang, Xuezhen; Green, Micah J.; Cheng, Zhengdong (13 September 2017). "Aqueous Exfoliation of Graphite into Graphene Assisted by Sulfonyl Graphene Quantum Dots for Photonic Crystal Applications". ACS Applied Materials & Interfaces. 9 (36): 30797–30804. doi:10.1021/acsami.7b06980. PMID 28816428. ^ Woltornist, S. J.; Oyer, A. J.; Carrillo, J.-M. Y.; Dobrynin, A. V; Adamson, D. H. (2013). "Conductive thin films of pristine graphene by solvent interface trapping". ACS Nano. 7 (8): 7062–6. doi:10.1021/nn402371c. PMID 23879536. ^ Kamali, A.R. ; Fray, D.J. (2013). "Molten salt corrosion of graphite as a possible way to make carbon nanostructures". Carbon. 56: 121–131. doi:10.1016/j.carbon.2012.12.076. ^ "How to tune graphene properties by introducing defects | KurzweilAI". www.kurzweilai.net. 30 July 2015. Retrieved 11 October 2015. ^ Hofmann, Mario; Chiang, Wan-Yu; Nguyễn, Tuân D; Hsieh, Ya-Ping (21 August 2015). "Controlling the properties of graphene produced by electrochemical exfoliation". Nanotechnology. 26 (33): 335607. Bibcode:2015Nanot..26G5607H. doi:10.1088/0957-4484/26/33/335607. PMID 26221914. ^ Tang, L.; Li, X.; Ji, R.; Teng, K. S.; Tai, G.; Ye, J.; Wei, C.; Lau, S. P. (2012). "Bottom-up synthesis of large-scale graphene oxide nanosheets". Journal of Materials Chemistry. 22 (12): 5676. doi:10.1039/C2JM15944A. ^ Gall, N. R.; Rut'Kov, E. V.; Tontegode, A. Ya. (1997). "Two Dimensional Graphite Films on Metals and Their Intercalation". International Journal of Modern Physics B. 11 (16): 1865–1911. Bibcode:1997IJMPB..11.1865G. doi:10.1142/S0217979297000976. ^ Jobst, Johannes; Waldmann, Daniel; Speck, Florian; Hirner, Roland; Maude, Duncan K.; Seyller, Thomas; Weber, Heiko B. (2009). "How Graphene-like is Epitaxial Graphene? Quantum Oscillations and Quantum Hall Effect". Physical Review B. 81 (19): 195434. arXiv:0908.1900. Bibcode:2010PhRvB..81s5434J. doi:10.1103/PhysRevB.81.195434. ^ Shen, T.; Gu, J.J.; Xu, M; Wu, Y.Q. ; Bolen, M.L. ; Capano, M.A. ; Engel, L.W. ; Ye, P.D. (2009). "Observation of quantum-Hall effect in gated epitaxial graphene grown on SiC (0001)". Applied Physics Letters. 95 (17): 172105. arXiv:0908.3822. Bibcode:2009ApPhL..95q2105S. doi:10.1063/1.3254329. ^ Wu, Xiaosong; Hu, Yike; Ruan, Ming; Madiomanana, Nerasoa K; Hankinson, John; Sprinkle, Mike; Berger, Claire; de Heer, Walt A. (2009). "Half integer quantum Hall effect in high mobility single layer epitaxial graphene". Applied Physics Letters. 95 (22): 223108. arXiv:0909.2903. Bibcode:2009ApPhL..95v3108W. doi:10.1063/1.3266524. ^ Lara-Avila, Samuel; Kalaboukhov, Alexei; Paolillo, Sara; Syväjärvi, Mikael; Yakimova, Rositza; Fal'ko, Vladimir; Tzalenchuk, Alexander; Kubatkin, Sergey (7 July 2009). "SiC Graphene Suitable For Quantum Hall Resistance Metrology". Nature Nanotechnology. 5 (3): 186–189. arXiv:0909.1193. doi:10.1038/nnano.2009.474. PMID 20081845. ^ Alexander-Webber, J.A. ; Baker, A.M.R. ; Janssen, T.J.B.M. ; Tzalenchuk, A.; Lara-Avila, S.; Kubatkin, S.; Yakimova, R.; Piot, B. A.; Maude, D. K.; Nicholas, R.J. (2013). "Phase Space for the Breakdown of the Quantum Hall Effect in Epitaxial Graphene". Physical Review Letters. 111 (9): 096601. arXiv:1304.4897. Bibcode:2013PhRvL.111i6601A. doi:10.1103/PhysRevLett.111.096601. PMID 24033057. ^ Sutter, P. (2009). "Epitaxial graphene: How silicon leaves the scene". Nature Materials. 8 (3): 171–2. Bibcode:2009NatMa...8..171S. doi:10.1038/nmat2392. PMID 19229263. ^ "Samsung's graphene breakthrough could finally put the wonder material into real-world devices". ExtremeTech. 7 April 2014. Retrieved 13 April 2014. ^ Lee, J. -H.; Lee, E. K.; Joo, W. -J.; Jang, Y.; Kim, B. -S.; Lim, J. Y.; Choi, S. -H.; Ahn, S. J.; Ahn, J. R.; Park, M. -H.; Yang, C. -W.; Choi, B. L.; Hwang, S. -W.; Whang, D. (2014). "Wafer-Scale Growth of Single-Crystal Monolayer Graphene on Reusable Hydrogen-Terminated Germanium". Science. 344 (6181): 286–9. Bibcode:2014Sci...344..286L. doi:10.1126/science.1252268. PMID 24700471. ^ Bansal, Tanesh; Durcan, Christopher A.; Jain, Nikhil; Jacobs-Gedrim, Robin B.; Xu, Yang; Yu, Bin (2013). "Synthesis of few-to-monolayer graphene on rutile titanium dioxide". Carbon. 55: 168–175. doi:10.1016/j.carbon.2012.12.023. ^ "A smarter way to grow graphene". PhysOrg.com. May 2008. ^ Pletikosić, I.; Kralj, M.; Pervan, P.; Brako, R.; Coraux, J.; n’Diaye, A.; Busse, C.; Michely, T. (2009). "Dirac Cones and Minigaps for Graphene on Ir(111)". Physical Review Letters. 102 (5): 056808. arXiv:0807.2770. Bibcode:2009PhRvL.102e6808P. doi:10.1103/PhysRevLett.102.056808. PMID 19257540. 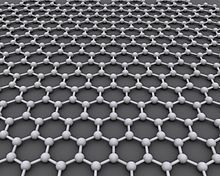 ^ "New process could lead to more widespread use of graphene". Gizmag.com. Retrieved 14 June 2014. ^ Mattevi, Cecilia; Kim, Hokwon; Chhowalla, Manish (2011). "A review of chemical vapour deposition of graphene on copper". Journal of Materials Chemistry. 21 (10): 3324–3334. doi:10.1039/C0JM02126A. ^ MacDonald, Fiona. "Researchers just made graphene 100 times more cheaply than ever before". ^ Choucair, M.; Thordarson, P; Stride, JA (2008). "Gram-scale production of graphene based on solvothermal synthesis and sonication". Nature Nanotechnology. 4 (1): 30–3. Bibcode:2009NatNa...4...30C. doi:10.1038/nnano.2008.365. PMID 19119279. ^ Quick, Darren (26 June 2015). "New process could usher in "graphene-driven industrial revolution"". www.gizmag.com. Retrieved 5 October 2015. ^ Bointon, Thomas H.; Barnes, Matthew D.; Russo, Saverio; Craciun, Monica F. (1 July 2015). "High Quality Monolayer Graphene Synthesized by Resistive Heating Cold Wall Chemical Vapor Deposition". Advanced Materials. 27 (28): 4200–4206. doi:10.1002/adma.201501600. PMC 4744682. PMID 26053564. ^ Das, Shantanu; Drucker, Jeff (10 March 2017). "Nucleation and growth of single layer graphene on electrodeposited Cu by cold wall chemical vapor deposition". Nanotechnology. 28 (10): 105601. Bibcode:2017Nanot..28j5601D. doi:10.1088/1361-6528/aa593b. PMID 28084218. ^ Li, Xiaolin; Zhang, Guangyu; Bai, Xuedong; Sun, Xiaoming; Wang, Xinran; Wang, Enge; Dai, Hongjie (2008). "Highly conducting graphene sheets and Langmuir–Blodgett films". Nature Nanotechnology. 3 (9): 538–542. arXiv:0808.0502. Bibcode:2008NatNa...3..538L. doi:10.1038/nnano.2008.210. PMID 18772914. ^ Zheng, Qingbin; Ip, Wai Hing; Lin, Xiuyi; Yousefi, Nariman; Yeung, Kan Kan; Li, Zhigang; Kim, Jang-Kyo (26 July 2011). "Transparent Conductive Films Consisting of Ultralarge Graphene Sheets Produced by Langmuir–Blodgett Assembly". ACS Nano. 5 (7): 6039–6051. doi:10.1021/nn2018683. PMID 21692470. ^ Cote, Laura J.; Kim, Franklin; Huang, Jiaxing (28 January 2009). "Langmuir−Blodgett Assembly of Graphite Oxide Single Layers". Journal of the American Chemical Society. 131 (3): 1043–1049. doi:10.1021/ja806262m. PMID 18939796. ^ Zheng, Qingbin; Zhang, Biao; Lin, Xiuyi; Shen, Xi; Yousefi, Nariman; Huang, Zhen-Dong; Li, Zhigang; Kim, Jang-Kyo (20 November 2012). "Highly transparent and conducting ultralarge graphene oxide/single-walled carbon nanotube hybrid films produced by Langmuir–Blodgett assembly". Journal of Materials Chemistry. 22 (48): 25072. doi:10.1039/c2jm34870e. ^ Denis, P. A.; Iribarne, F. (2013). "Comparative Study of Defect Reactivity in Graphene". Journal of Physical Chemistry C. 117 (37): 19048–19055. doi:10.1021/jp4061945. ^ Yamada, Y.; Murota, K; Fujita, R; Kim, J; et al. (2014). "Subnanometer vacancy defects introduced on graphene by oxygen gas". Journal of the American Chemical Society. 136 (6): 2232–2235. doi:10.1021/ja4117268. PMID 24460150. ^ Eftekhari, A.; Jafarkhani, P. (2013). "Curly Graphene with Specious Interlayers Displaying Superior Capacity for Hydrogen Storage". Journal of Physical Chemistry C. 117 (48): 25845–25851. doi:10.1021/jp410044v. ^ Yamada, Y.; Yasuda, H.; Murota, K.; Nakamura, M.; Sodesawa, T.; Sato, S. (2013). "Analysis of heat-treated graphite oxide by X-ray photoelectron spectroscopy". Journal of Materials Science. 48 (23): 8171–8198. Bibcode:2013JMatS..48.8171Y. doi:10.1007/s10853-013-7630-0. ^ Yamada, Y.; Kim, J.; Murota, K.; Matsuo, S.; Sato, S. (2014). "Nitrogen-containing graphene analyzed by X-ray photoelectron spectroscopy". Carbon. 70: 59–74. doi:10.1016/j.carbon.2013.12.061. ^ Eftekhari, A.; Garcia, H. (2017). "The Necessity of Structural Irregularities for the Chemical Applications of Graphene". Materials Today Chemistry. 4: 1–16. doi:10.1016/j.mtchem.2017.02.003. ^ Dissanayake, D. M. N. M.; Ashraf, A.; Dwyer, D.; Kisslinger, K.; Zhang, L.; Pang, Y.; Efstathiadis, H.; Eisaman, M. D. (12 February 2016). "Spontaneous and strong multi-layer graphene n-doping on soda-lime glass and its application in graphene-semiconductor junctions". Scientific Reports. 6: 21070. Bibcode:2016NatSR...621070D. doi:10.1038/srep21070. PMC 4751575. PMID 26867673. ^ Zhong, Mengyao; Xu, Dikai; Yu, Xuegong; Huang, Kun; Liu, Xuemei; Xu, Yang; Yang, Deren (2016). "Interface coupling in graphene/fluorographene heterostructure for high-performance graphene/silicon solar cells". Nano Energy. 28: 12–18. doi:10.1016/j.nanoen.2016.08.031. ^ Akinwande, D.; Tao, L.; Yu, Q.; Lou, X.; Peng, P.; Kuzum, D. (1 September 2015). "Large-Area Graphene Electrodes: Using CVD to facilitate applications in commercial touchscreens, flexible nanoelectronics, and neural interfaces". IEEE Nanotechnology Magazine. 9 (3): 6–14. doi:10.1109/MNANO.2015.2441105. ^ "GRAPHENITE™ – GRAPHENE INFUSED 3D PRINTER POWDER – 30 Lbs – $499.95". noble3dprinters.com. Noble3DPrinters. Archived from the original on 17 May 2016. Retrieved 16 July 2015. ^ Peleg, Roni (5 May 2015). "World's first commercial graphene-based supercapacitor chosen for use in spacecraft". Graphene-info. Archived from the original on 17 August 2017. Retrieved 17 August 2017. ^ Peleg, Roni (1 June 2017). "Skeleton uses curved graphene in its new supercapacitor-based energy storage system". Graphene-info. Archived from the original on 17 August 2017. Retrieved 17 August 2017. ^ Turpen, Aaron (25 April 2016). "Graphene-based ultracapacitors give trucks a boost of acceleration". newatlas.com. Retrieved 30 April 2017. ^ Lin, Tianquan; Chen, I-Wei (18 December 2015). "Nitrogen-doped mesoporous carbon of extraordinary capacitance for electrochemical energy storage". Science. 350 (6267): 1508–1513. doi:10.1126/science.aab3798. PMID 26680194. Retrieved 28 November 2018. ^ a b Muoio, Danielle (17 October 2016). "Henrik Fisker is using a revolutionary new battery to power his Tesla killer". Business Insider. Business Insider. Archived from the original on 16 August 2017. Retrieved 16 August 2017. ^ Wayland, Michael (21 July 2017). "Fisker, emerging battery supplier Nanotech end Joint Venture". Avtomotive News. Automotive News. Archived from the original on 16 August 2017. Retrieved 16 August 2017. ^ "BAC Debuts First Ever Graphene Constructed Vehicle". 2 August 2016. Retrieved 4 August 2016. ^ a b Vijayenthiran, Viknesh (7 August 2016). "BAC Mono gets ultra-strong, ultra-light graphene panels". Motor Authority. Archived from the original on 17 August 2017. Retrieved 17 August 2017. ^ Vijayenthiran, Viknesh (4 March 2015). "Spain's GTA reveals new version of Spano V-10 supercar at 2015 Geneva auto show". Motor Authority. Archived from the original on 17 August 2017. Retrieved 17 August 2017. ^ Hof, F.; Boni, A.; Valenti, G.; Huang, K.; Paolucci, F.; Penicaud, A. (2017). "From Food Waste to Efficient Bifunctional Nonprecious Electrocatalyst". Chem. Eur. J. 23 (61): 15283–15288. doi:10.1002/chem.201704041. PMID 28868759. ^ "Global Demand for Graphene after Commercial Production to be Enormous, says Report". AZONANO.com. 28 February 2014. Retrieved 24 July 2014. ^ Lalwani, Gaurav; D'Agati, Michael; Mahmud Khan, Amit; Sitharaman, Balaji (2016). "Toxicology of graphene-based nanomaterials". Advanced Drug Delivery Reviews. 105 (Pt B): 109–144. doi:10.1016/j.addr.2016.04.028. PMC 5039077. PMID 27154267. Full Text PDF. ^ Port, Jennifer; Murphy, Daniel J. (2017). "Mesothelioma: identical routes to malignancy from asbestos and carbon nanotubes" (PDF). Current Biology. 27 (21): R1156–R1176. doi:10.1016/j.cub.2017.07.026. PMID 29112873. ^ Chernova, Tatyana; Murphy, Fiona A.; Galavotti, Sara; Sun, Xiao-Ming; Powley, Ian R.; Grosso, Stefan; Schinwald, Anja; Zacarias-Cabeza, Joaquin; Dudek, Kate M.; Dinsdale, David; al., et (2017). "Long-fiber carbon nanotubes replicate asbestos-induced mesothelioma with disruption of the tumor suppressor gene Cdkn2a (Ink4a/Arf)" (PDF). Current Biology. 27 (21): 3302–3314. doi:10.1016/j.cub.2017.09.007. PMC 5681354. PMID 29112861. ^ "Jagged graphene edges can slice and dice cell membranes – News from Brown". brown.edu. ^ Li, Y.; Yuan, H.; von Dem Bussche, A.; Creighton, M.; Hurt, R. H.; Kane, A. B.; Gao, H. (2013). "Graphene microsheets enter cells through spontaneous membrane penetration at edge asperities and corner sites". Proceedings of the National Academy of Sciences. 110 (30): 12295–12300. Bibcode:2013PNAS..11012295L. doi:10.1073/pnas.1222276110. PMC 3725082. PMID 23840061. ^ DiVincenzo, D. P.; Mele, E. J. (1984). "Self-Consistent Effective Mass Theory for Intralayer Screening in Graphite Intercalation Compounds". Physical Review B. 295 (4): 1685–1694. Bibcode:1984PhRvB..29.1685D. doi:10.1103/PhysRevB.29.1685. ^ Ruess, G.; Vogt, F. (1948). "Höchstlamellarer Kohlenstoff aus Graphitoxyhydroxyd". Monatshefte für Chemie (in German). 78 (3–4): 222–242. doi:10.1007/BF01141527. ^ "Discussion on graphene's early history and Boehm's 1962 isolation of graphene". Graphene-Info. 16 March 2017. ^ "Many Pioneers in Graphene Discovery". Letters to the Editor. Aps.org. January 2010. ^ Boehm, H. P.; Clauss, A.; Fischer, G.; Hofmann, U. (1962). "Surface Properties of Extremely Thin Graphite Lamellae" (PDF). Proceedings of the Fifth Conference on Carbon. Pergamon Press. ^ "United States Patent: 7071258". US Patent Office. Retrieved 12 January 2014. ^ "The Story of Graphene". October 2014. Following discussions with colleagues, Andre and Kostya adopted a method of surface science were using –using simple Sellotape to peel away layers of graphite to expose a clean surface for study under the microscope. ^ a b Zhang, Y.; Tan, Y. W.; Stormer, H. L.; Kim, P. (2005). "Experimental observation of the quantum Hall effect and Berry's phase in graphene". Nature. 438 (7065): 201–204. arXiv:cond-mat/0509355. Bibcode:2005Natur.438..201Z. doi:10.1038/nature04235. PMID 16281031. ^ "Graphene pioneers bag Nobel prize". Institute of Physics, UK. 5 October 2010. ^ Burn-Callander, Rebecca (1 July 2014). "Graphene maker aims to build British, billion-pound venture". Daily Telegraph. Retrieved 24 July 2014. ^ Gibson, Robert (10 June 2014). "Consett firm Thomas Swan sees export success with grapheme". The Journal. Retrieved 23 July 2014. ^ "Global breakthrough: Irish scientists discover how to mass produce 'wonder material' graphene". The Journal.ie. 20 April 2014. Retrieved 20 December 2014. ^ "Graphene biosensors – finally a commercial reality". www.newelectronics.co.uk. Retrieved 9 August 2017.